Every fall my kids and I look forward to making jack-o-lanterns and cutting open our pumpkins to take out the seeds and roast them. 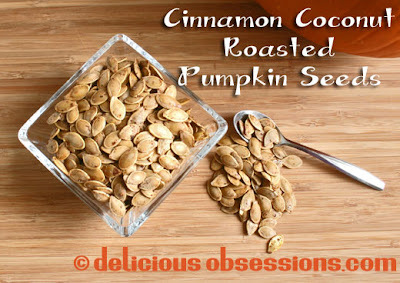 Each year I like to try new pumpkin seed recipes- some years I make them savory, some years sweet. 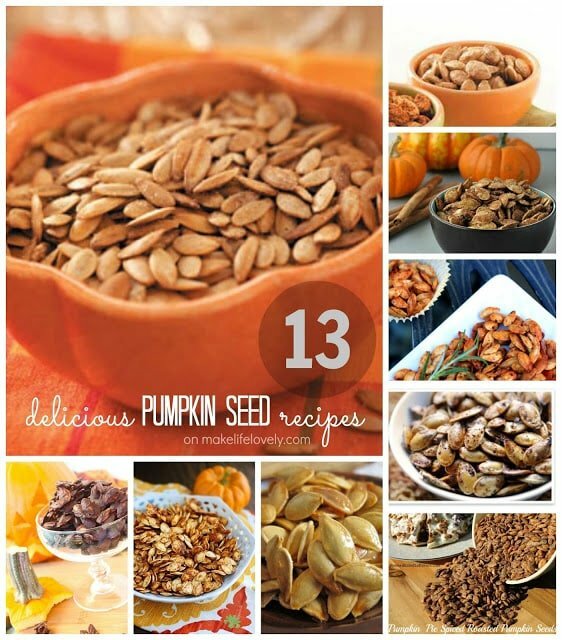 You really can’t go wrong with any of these pumpkin seed recipes! 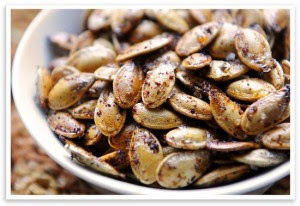 If you love pumpkin seeds as much as we do, you’ll love this roundup of delicious pumpkin seed recipes that I put together for you to enjoy! Have fun trying out the different combinations, and let me know which way is your favorite! 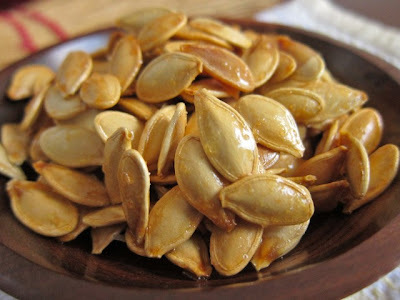 Garlic Pumpkin Seeds, by Taste of Home- There’s no excuse not to make this easy recipe- you can make these garlic pumpkin seeds right in the microwave! 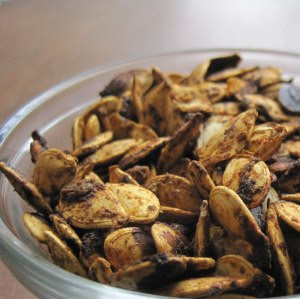 Pumpkin Pie Spiced Roasted Pumpkin Seeds, by Premeditated Leftovers- I love the flavor of pumpkin pie spices, and it’s only appropriate that they be added to roasted pumpkin seeds, don’t you think? Candied Pumpkin Seeds Recipe, by Just a Pinch Recipes- I love eating candied nuts, so you know I’m wanting to try these candied pumpkin seeds… yum! 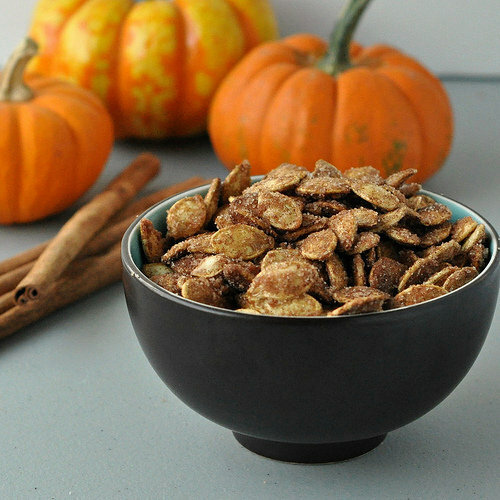 Spicy Pumpkin Seeds, by Survival at Home- I’m a sucker for anything spicy, and pumpkin seeds are no exception! 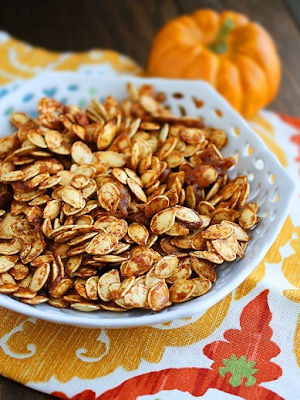 These spicy pumpkin seeds are definitely on my must-try list! 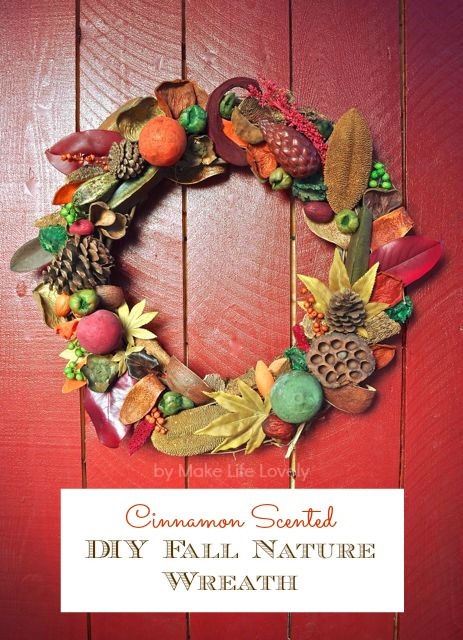 Cinnamon and Sugar Pumpkin Seeds, by Circle of Moms- You had me at cinnamon and sugar! This is one of my kids’ favorite ways to enjoy pumpkin seeds. 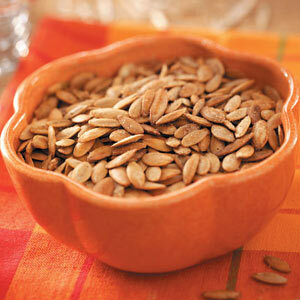 Spicy Herbed Pumpkin Seeds, by About Time- This savory recipe includes the delicious addition of chipotle chili powder. Sounds delicious! 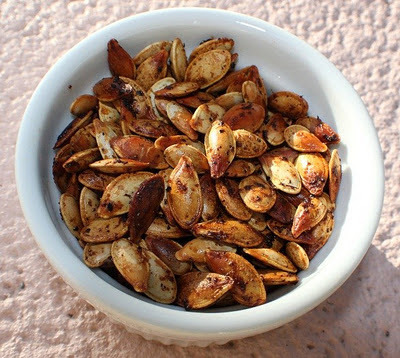 Chile Lime Roasted Pumpkin Seeds, by The Austin Gastronomist- Oooh, I never thought about adding lime to pumpkin seeds, but I bet it tastes amazing on pumpkin seeds with the chili powder… going on my ever growing list of recipes to try. 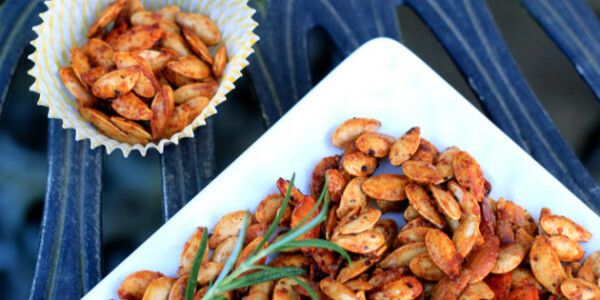 Italian Style Roasted Pumpkin Seeds, by What’s Cookin’ Italian Style Cuisine- I’m convinced that everything tastes better with rosemary on it, and pumpkin seeds are no exception! 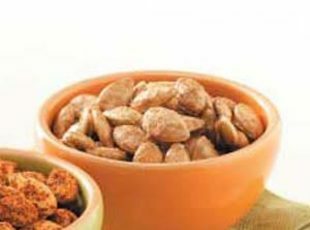 Cajun Barbecue Pumpkin Seeds, by The Daily Meal- Barbecue flavor anything tastes amazing, so I can’t wait to try these cajun barbecue pumpkin seeds. 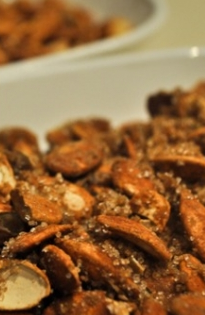 Salted Caramel Pumpkin Seeds, by The Comfort of Cooking- Salted caramel pumpkin seeds?!? Two words- YES PLEASE!! Toasted Kettle Corn Pumpkin Seeds, by Thyme Bombe- I’ve already professed my love for kettle corn with you (and shared my easy recipe for making it), so I know I would love to gobble up this delicious recipe for toasted kettle corn pumpkin seeds! 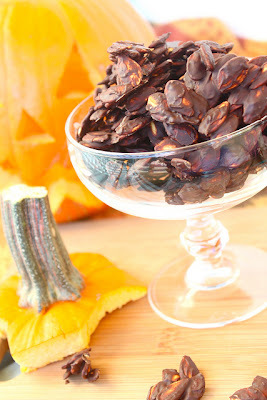 Sweet n’ Salty Chocolate Covered Pumpkin Seeds, by The Diva Dish- We all know chocolate makes everything better, and that includes pumpkin seeds! 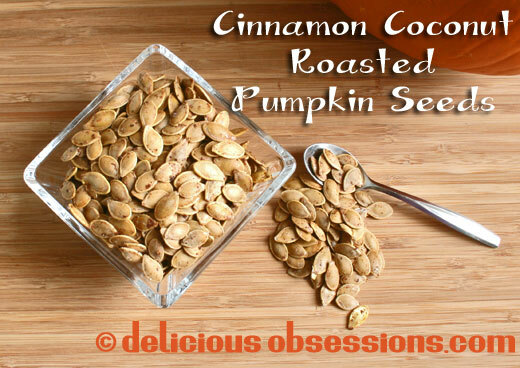 Cinnamon Coconut Roasted Pumpkin Seeds Recipe, by Delicious Obsessions- Cinnamon and coconut sound like an amazing combination to top your pumpkin seeds with! 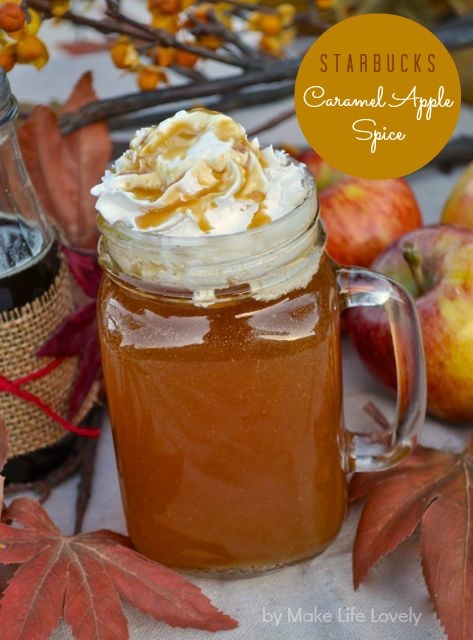 My make at home Starbucks Caramel Apple Spice drink would taste great with pumpkin seeds! 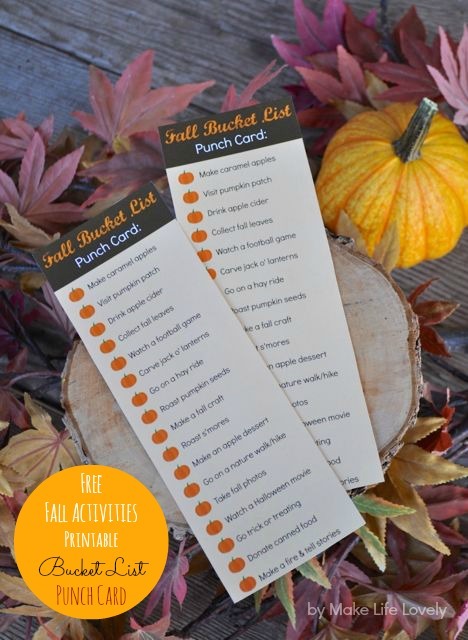 For more fall fun, you can print off my fall activities bucket list punch card, and punch a hole in the pumpkins each time you complete a fall activity with your family! What a delicious round up! I have pumpkin seeds drying right now – leftover from making pumpkin puree yesterday, so this is very timely. 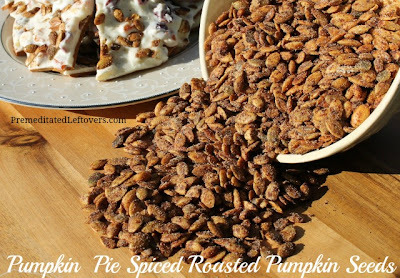 Thanks for sharing the link to my pumpkin pie spiced pumpkin seeds. I look forward to giving some of the other flavors a try. 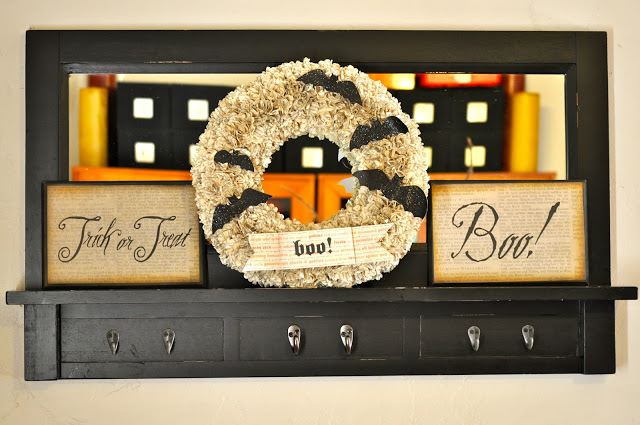 I featured this page on my blog! 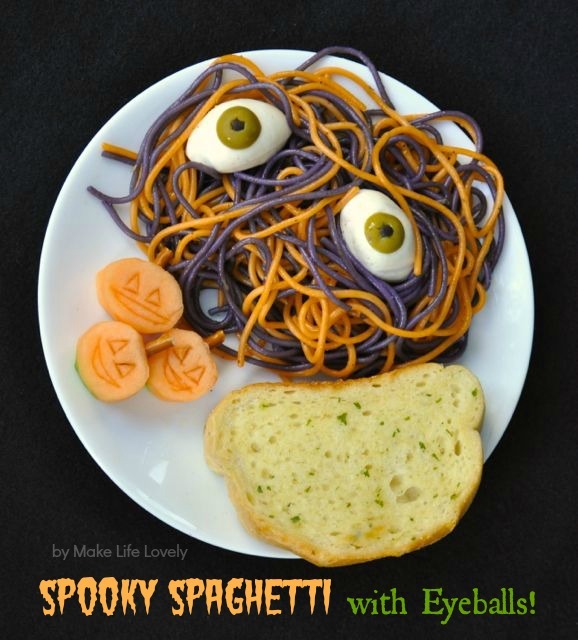 Great recipe ideas! This is awesome! Would LOVE for you to link it to Friday Favorites at http://imnotatrophywife.com today!! Thank you!! !